It won’t join the Competitive Play queue just yet, though. 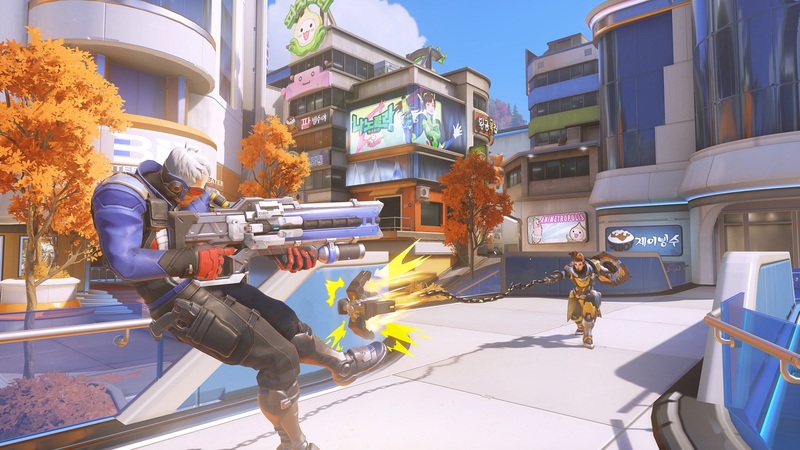 After a lengthy period on Overwatch’s test server, the new Busan map is finally ready for wide release. Blizzard updated the live server today, uploading the new control map to Overwatch on PlayStation 4, Xbox One, and PC. The new map is set in Overwatch hero D.Va’s hometown of Busan, South Korea. There are three main areas of the map: a sanctuary, D.Va’s MEKA base, and a downtown area. Each area has its own particular feel and optimal play style, which makes for exciting, competitive matches. As always, the new map will stay disabled in Overwatch’s competitive queue for a couple weeks while players get used to it in the Arcade, custom games, and Quick Play. A brief waiting period for new content, either heroes or maps, is standard in Overwatch. Busan was revealed on Aug. 22 during an Overwatch fan event held in South Korea. D.Va was the “shooting star” of the event—Blizzard released the new map on the PTR that day, as well as a new cinematic, Shooting Star, that showed Overwatch fans a different side of the South Korean hero. D.Va also got a new Epic skin, called Nano-Cola D.Va, that was only unlockable during an event called D.Va’s Nano-Cola Challenge. Players were tasked with scoring nine wins in Overwatch, but the challenge has since ended. The D.Va Nano-Cola skin has since been pulled back into the vault. If you didn’t earn it during the challenge, you can still catch a glimpse of it on the Busan map, however.